This network type is useful in forcing traffic from multiple sites go via the HQ, or central location. In the example below, this means all traffic is going to flow through R3. I highlighted some important stuff. 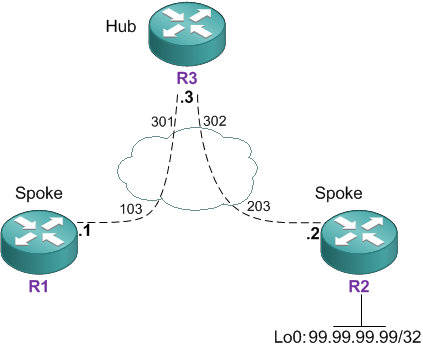 In this network type, OSPF hello’s are sent as multicasts to 224.0.0.5. In order for multicasts to be transmitted, we have to enable the broadcast keyword on the frame-relay map statements (more info on the broadcast keyword here). The other important thing, is that their is no requirement for R1 to have a DLCI to R2. Instead, R3 will inject itself as the next hop for reachability between the two spokes. You can see this in R1’s routing table below. As you can see from R1’s point of view, the 99.99.99.99 network (on R2’s loopback) is accessible via R3’s IP address. Even R2 itself, is only accessible via R3. This is actually because R3 treats the connection to each spoke like a point-to-point link; meaning R3 is always gonna be the next hop between them. You can see this when you check the ospf database below. The output shows that R3 is sending type 1 router LSA’s that describe R1 and R2 as being connected to it via a point-to-point network type. One last cool feature I want to show is the neighbor cost command. So I’m gonna change the network a bit so we can have a play. See the new topology below. You can see the significance of this when checking R3’s routing table. He now has two equal cost paths to the new network 12.12.12.0/24. If we want to influence R3 to choose the path via R1 as the best path to this network, we would normally assign a lower cost to the interface of the neighbor we want to prefer. However, we’re only using 1 interface to connect both neighbors here. So we can use the neighbor command to assign the cost instead. Let’s do that now on R3. Cool, R3 now prefers the path via R1. Just incase you’re wondering how the cost is 6 and not 5, this is because R1 added a cost of 1 as the route was incoming via Fa0/0. R3 then added a cost of 5 as it came in via S1/0. – Typical in a hub and spoke or partial mesh design. – Can be used in a full mesh OSPF neighborship design (i.e. traffic does not always have to go via the hub). Thanks a lot! This article is great especially with the addition of neighbor cost command and the Quick Facts. I was taking notes when I was reading and I have seen more of them on the Quick Facts section.